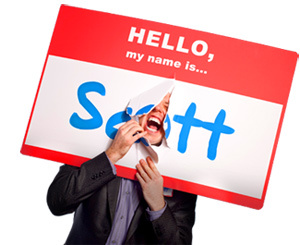 Seven Deadly Sins of Ineffective Nametags - HELLO, my name is Scott! Your nametag is your best friend. It is a lifesaver in meetings, trade shows and events to start conversations when you meet groups of new people. It also identifies you as well as your company in the minds of others. As a result, you will become more approachable so you can connect and communicate with anybody. Unfortunately, nametags are useless and ineffective if they are designed and worn without careful consideration. If you avoid The Seven Deadly Sins of Ineffective Nametags, you will maximize your approachability when you make your nametag more visible, accessible and efficient. You will also discover that when you invite people to ‘step onto your front porch,’ they will cross the chasm between a stranger and a friend, or a prospect and a customer. How many times has someone rudely squinted at your chest desperately trying to make out those tiny letters? This is self defeating, embarrassing and actually works to decrease your approachability. Not to mention it makes the other person feel ridiculous! So, much like a retail price tag, your nametag must be readable from ten feet away — both the font and the nametag itself. According to a nametag survey done by David Alder of Biz Bash, 50% of a group of meeting planners claimed that ‘illegible font size of nametags was a major problem.’ And, consider the 75 million baby boomers that have reached, or will reach their bifocal days, this is a top priority. The recommended font size is 24 point – hopefully bigger if possible. Also be certain to avoid cursive, script or other fancy letters. Other than that, make sure that any supplementary, less important text is significantly smaller than the name itself. Remember, they call them nametags because the name must be the focal point, whether it’s the name of the person or the name of the company, those are the two most important pieces of information. The most effective background color for nametags is white. This allows maximum visibility for your logo, name and position. Dark blue, green or red backgrounds are used occasionally, but they have a tendency to ‘steal the show’ from the rest of your nametag. Write the font in black or dark blue. Never use yellow, orange or any other light color. Even if a dark color choice means an aesthetic digression, fashion must be outweighed by your nametag’s approachability and visibility! Finally, unless you work in an academic capacity, avoid gold nametags. A frustrating nametag problem that people face is ‘the nametag turnaround.’ No name. No logo. No company. Just the blank back of the badge! While lanyard or necklace style nametags reduce clothing damage, no doubt these will get accidentally turned around and tangled at some point! The horizontal placement of your nametag is a function of the context in which you wear it. For example, on the right, nametags will be easily visible in the line of sight that correlates to your handshake. Most businesses handbooks will instruct you to wear nametag in this manner. And, it is a good visual aid for people who have can’t remember names—which is everyone! On the other hand, for mobile and populated events such as trade shows, expos and conventions, it is more effective to wear your nametag on your left side. This allows people who approach in your opposite direction to see your nametag with significant ease, since we traditionally walk on the right side of the road/aisle/hallway. Although horizontal placement of your nametag is an important consideration, vertical placement is the most important visibility characteristic. A nametag in the middle of your chest is likely to get covered by your arms, papers or some other obstruction. Furthermore, central placement of your nametag will make you unavailable to people outside of your conversation, thus limits your ability to meet more valuable people. So, your nametag is pointless if it’s worn below your breastbone. The most effective location is two to three inches below your collar bone on whichever side most appropriate for your function. This allows maximum eye contact. Furthermore, high vertical placement of your nametag eliminates the possibility that it will be covered by something. For example, if your nametag hangs too low, it will be impossible for other people to read it when you: sit down, cross your arms, wear a jacket, write down information or use gestures while you talk. Have you ever seen a five inch nametag with tiny letters the size of sunflower seeds? What a waste! Use any and all blank space provided by your nametag. Make it huge! Don’t worry if you look silly, because everyone looks silly! And, although font size must be large anyway, don’t hesitate to increase the font commensurate with the size of the nametag itself. Imagine your nametag is a personal advertisement. Maximize your space efficiently. Think about this: you will never see a billboard on the highway that only uses half the space provided! 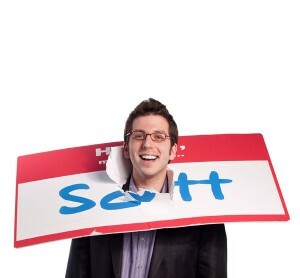 The next time you go to a meeting, convention, seminar or trade show, remember that your nametag is your best friend. In other words, think of your nametag as your ‘front porch.’ It invites people. It makes them feel comfortable. And, it initiates conversations that transform strangers into valuable connections. But, like any good front porch, it’s important to create and wear nametags that are visible, accessible, and efficient so you will maximize your approachability. Have you ever NOT wanted to wear the nametag given to you?